Investors who avoided the dodgiest countries in terms of environmental, social and governance standards would have missed out on huge returns. (Bloomberg) --Altruism has proven a lousy guide for stock pickers this year. Investors who avoided the dodgiest countries in terms of environmental, social and governance standards would have missed out on huge returns. 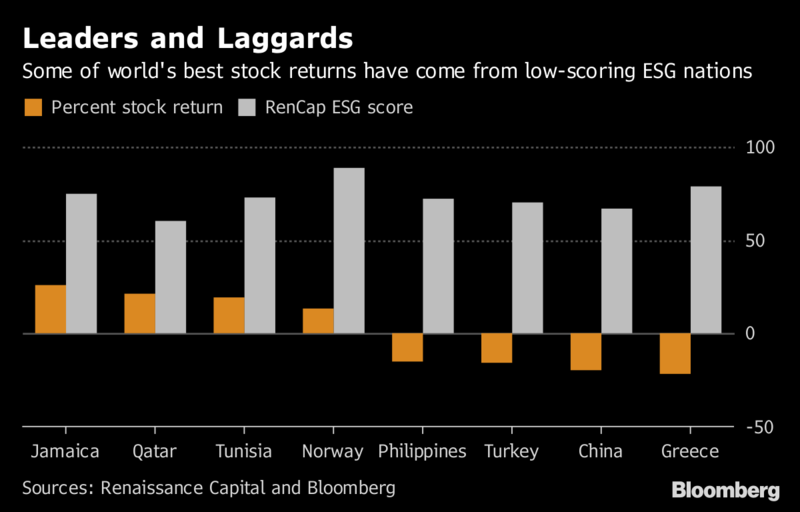 In Qatar, stocks soared 27 percent in dollar terms to lead gains despite the worst ESG score in emerging markets, according to an analysis by Renaissance Capital. The most lucrative developed markets have been Israel, which has the lowest Renaissance ESG score in absolute terms, and the U.S., lowest when adjusted per capita. Among frontier markets, Saudi Arabia -- now in the throes of a diplomatic crisis after the murder of journalist Jamal Khashoggi -- can point to a 9.3 percent rally in the Tadawul All Share Index despite a low ESG score. Meantime, equities from Chile to Denmark and Poland, among the standouts for socially conscious investors, have been laggards in 2018. That doesn’t mean investors should ignore ESG, however. Charles Robertson, RenCap’s London-based chief economist who wrote the report, said there’s a small correlation between ESG rankings and stock performance in more liquid markets, largely driven by oil-rich nations, and it’s possible that high-scoring ESG nations will perform better over time as the idea gains traction. "Market prices tell us that ESG investing has not yet been a route to deliver much (equities) or any (debt) outperformance," he said. "This may change as more money is allocated to ESG funds."